The drive reject everything: music CD, data CD or DVD. 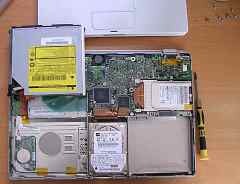 Shutdown the Powerbook, remove the battery (blue arrow) and the 8 torx screws (yellow arrows). 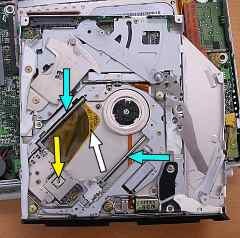 As the "operation" had to be done in an urgency: I just unplug the drive connector (yellow arrow) and raise up the drive. 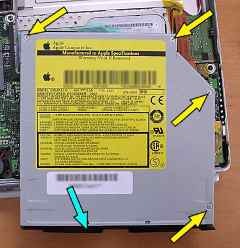 Caution: the drive is clamped in the chassis through rubber pins (blue arrows). The drive partially removed: it just stay hold to the chassis by the ground cable: gently remove it. Right above: the 8 torx screws. Right to the G4: my multi-blades screwdriver. Yellow arrows: two cruciform screws to be removed to extract the combo drive from its craddle. On the other side, the same screws. 2. Remove the facade cache (blue arrow). 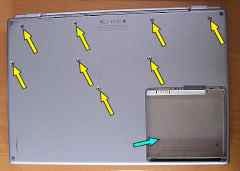 Once the screws removed, raise the cover from the side with the 3 screws (see the picture at point 6 just above) and then smoothly detach the cover by pushing it in the direction pointed by the blue arrow. Push to the top the guide (blue arrow) and, again, 4 screws to extract the guide's cache (yellow arrows). The ribbon straights up, rubbing against the optical head. I clean the lens with isopropylic alcohol (yellow arrow) and do the same for the two axes (blue arrows). Then, I put some sewing machine oil on the cleaned axes. The white arrow points to the ribbon I just stick onto the chassis with some double-faced tape. And as usual: same instructions in reverser ordre to rebuilt the machine.